Sony Xperia Z5 Premium was announced recently at IFA and is the world's first smartphone with 4K display. But the release date of the Z5 Premium along with other Z5 lineup are set for October. On other hand, Samsung Galaxy Note 5 has just started it's pre booking and will take a while to get in your hands. 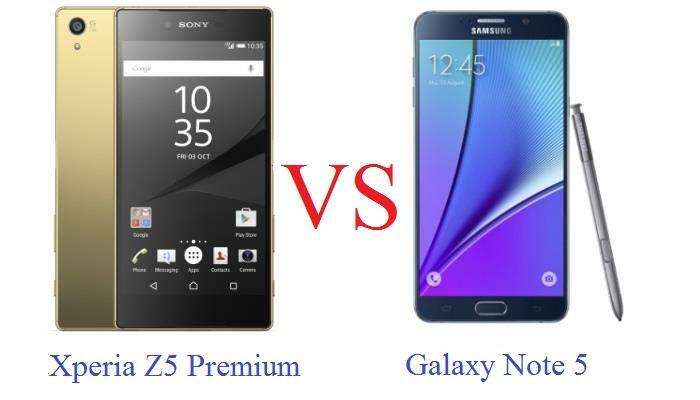 At this occasion if you are confused in selecting between Xperia Z5 Premium and Galaxy Note 5, then this comparison will help you choose the right device. 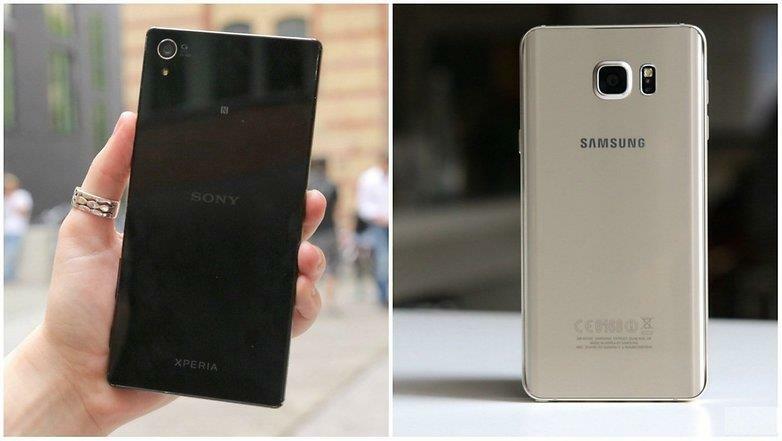 Sony Xperia Z5 along with other Z5 lineup were recently announced at IFA 2015. Xperia Z5 Premium being the Sony's current flagship and the world's first smartphone having 4K display is compared with the Samsung's current flagship, the Galaxy Note 5. Since both being the flagships of their respective manufactures, Sony and Samsung will be packing these devices with the best technologies and features that they have invented till now. So this article right here will be comparing the two flagships and if you have a thought in your mind to buy a flagship device from a branded smartphone manufacturer, then this comparison will definitely help you out. Let us move on to the complete comparison and we will find out which flagship is the best one to go for, Xperia Z5 Premium or Galaxy Note 5. Sony Xperia Z5 Premium looks and feels like lot of other Sony devices; it is a clean rectangular slab with a metal frame and glass on the front and back. If you are a person who is used to Sony designs, then you will definitely love the design of Z5 Premium. Even though the design delivered by Sony is simplistic, it does look very great and will feel pretty great in your hands with a very solid feel. Now talking about the design of Samsung Galaxy Note 5, this have tried to be innovative this time around, as the other devices launched by Samsung till now have a glass and metal design. Here the Note 5 has similar glass and metal design just like the Z5 Premium, but there is a little bit more curvature along the edges of Note 5 and this makes it easier and comfortable to hold. Thus the Note 5 looks and feels better when compared to the Sony's Xperia Z5 Premium. However, both the devices are really great in terms of their build quality. While Samsung is aiming on luxury through Note 5, Sony is focusing on delivering a functional device through Z5 Premium. The key feature to note about the Z5 Premium is its IP 68 certified screen with which it can resist dust and water over 1.3 meters and for up to 30 minutes. But unfortunately there is no such protection apart from Corning Gorilla Glass 4 in Note 5. Talking about the variants, Z5 Premium offers three colors- Chrome, Black and Gold. From these, the Z5 Premium with a Chrome finish and gold color is most astonishingly beautiful, but if you are fond of black, then it is no ugly duckling either. There are many color choices offered by Samsung too if you are going for Note 5. The device comes in Black Sapphire, Gold Platinum, Silver Titan and in White Pearl. As far as the display goes, the Xperia Z5 Premium is the first smartphone in the world with a 4K display. It can deliver you a whopping ppi of 806, which no other smartphone in the world has. It is extremely superb to see a 4K display within a smartphone and it will add more proud to the users, especially the born Sony fans. However, the Galaxy Note 5 is not at all back in terms of display, as it delivers a fabulous Quad HD AMOLED panel which is great in looks and is very bright, saturated and vibrant. Looking forward to the resolution, with 518 ppi it is pretty clear who the winner is here. Still, Note 5 is still far ahead against all other competitors in terms of resolution except the Z5 Premium. But in terms of brightness, Note 5 stands ahead of Z5 premium and its screen can be seen lot easily outdoors with its bright screen. Overall both the devices holds absolutely fantastic screens and you could do pretty much anything you want to do on a smartphone with big screens. One similarity that you will find on both of these devices is the built-in fingerprint scanner that enables bio-metric security for your device. Although this security measure is becoming very popular even in mid-range smartphones, Sony is launching this feature for first time through its Xperia Z5 lineup. However the positioning of the fingerprint scanners differs in both these devices. For Galaxy Note 5, the scanner is embedded on the home screen, which is the typical positioning for Samsung, whereas on the Xperia Z5 Premium this scanner is embedded in the power button which makes more accessible and is really an unique position from all other fingerprint-enabled smartphones out there. Just by pressing on the power button, your fingerprint will automatically unlock Xperia Z5's screen without having to go through two step process that most of the smartphones do. In terms of everyday performance, both these devices are top notch. With that being said, Xperia Z5 Premium has been packed by Sony with a Cortex-based octa-core processor powered by Qualcomm Snapdragon 810 and does its job pretty decently with 1.9 GHz of speed. Talking about Galaxy Note 5, Samsung has packed it with their typical Exynos chipset powered with Cortex-based octa-core processor that gives up to 2.1 GHz of speed. The GPU offered by the Note 5 is the Mali-T760MP8, whereas you could find an Adreno 430 as GPU in the Z5 Premium. While looking in to the RAM delivered within these devices, Samsung had its edge here too with a 4 GB of RAM delivering smooth and tidy performance. Whereas Sony has delivered only 3 GB of RAM, but still the device manages to deliver quick and snappy performance. Thus there is no big change in this field and you could go for any of these devices, since both are delivering same level of performance. In terms of storage delivered, Xperia Z5 Premium features only one variant with 32 GB of internal storage, whereas Note 5 offers two variants with either 32 GB or with 64 GB of internal storage to go for. However the clear winner in this department is the Xperia Z5 Premium as Sony has delivered storage expansion option up to 200 GB via microSD card which Samsung has not given for Note 5. If cases arise where you have to depend on your external storage, then Z5 Premium is your best option to go for. In terms of connectivity, both these devices come with similar features including NFC, but the Note 5 stood ahead with additional features such as Samsung Pay mobile payment, S Pen stylus etc. Here in this field, both the Xperia Z5 Premium and the Galaxy Note 5 are running on Android 5.1.1 Lollipop, but the experience vary through the user interface powered within these devices. On the Z5 Premium you will be having an experience closer to the stock Xperia UI, which might be unsatisfactory for many who love to feel all the material design provided by Lollipop, but there are some software features that are integrated with the Xperia UI like the PlayStation integration and other small applications that are used to make your multi tasking much smoother. An important field to look always when going for a flagship device is its camera. A device does not just become a flagship unless it has got an impressive camera. Firstly moving on to Xperia Z5 Premium, it has got a brilliant 23MP rear shooter with Sony Exmor RS sensor with super-fast face detection autofocus and steady shot stabilization. Z5 Premium also features a 23 mm wide angle F2.0 lens. On the other hand, Galaxy Note 5 sports a stunning 16 MP shooter with F 1.9 lens and comes with optical image stabilization. While talking about other camera features, both these devices are capable of shooting videos at 2160p. Also the Note 5 comes with various features such as dual shot, simultaneous HD video and image recording, dual video recording etc. Xperia Z5 Premium delivers bunch of Sony filters and is decorated with outstanding camera modes. Also both the devices comes with standard camera features like HDR, panorama etc. Both of these devices also comes with front-facing full HD camera with nearly equal specs with 5 MP. With all the fantastic specs mentioned above, the devices need large and powerful batteries to feed these power-hungry specs and to survive at least for a day. For this purpose the Note 5 has been delivered with an impressive non-removable Li-Po 3000 mAh battery, while Sony has packed its flagship with a larger non-removable Li-Po battery with 3430 mAh power within. Besides having a large capacity, Sony also promises a 2-days of battery life on a single charge. Moreover Sony even delivers fast battery charging through Quick Charge 2.0, by which the device could easily get topped up to 60% in 30 minutes. On other hand, Galaxy Note 5 supports wireless charging that could easily charge your smartphone without having the phone connected via microUSB cable. But the battery life that the Note 5 offers could typically last up to one day of usage. As a result, Xperia Z5 Premium is the clear winner in this field, however the promise from Sony has to be put on a test. Sony Xperia Z5 Premium being the only smartphone with 4K display, it stands way front than that of the Galaxy Note 5. Apart from a 4K display, the Z5 Premium offers more great features like better battery life, slightly better camera, expandable storage up to 200 GB etc. But Galaxy Note 5 on other hand offers some extra features like improved UI, better brightness, S Pen features, slightly better design etc. If you are looking for a device that stands unique from all other currently launched smartphones, then going for Z5 Premium will be the better choice, but if you love the sleek design, S Pen's wonderful features and can tolerate without having external storage, then you can go for the Galaxy Note 5.